There are few trees on this planet that can be used integrally, without discarding any part – not even the bark or the nuts of the fruit. Meet the marula tree, one of the treasures native to Africa. Even though the tree is highly prized for its marula fruit, we will also talk below about its many other uses. The marula tree grows throughout 29 sub-Saharan African countries – starting from Cape Verde to South Africa and Ethiopia. It’s a great source of sustenance given its fruit rich in Vitamin C and the nutritious nut at its core. The marula crop has yet to be domesticated. However, humans have intentionally cultivated it in the wild for hundreds of years. This is visible through its distribution which closely matches human migration patterns. One of the most important strength of the marula tree is its high tolerance for inhospitable terrain and climates, as well as pests or diseases. A hot, dry climate is where the marula thrives, while it also tolerates saline water. It’s not surprising that this African treasure continues to grow well even through droughts. Moreover, the marula tree is a great reforestation tool. When planted in areas that suffer from the effects of desertification and deforestation, the tree serves for regenerative purposes. Leafy and gorgeous, the average marula tree grows up to 9 meters tall. It is very low maintenance when it comes to the soil it grows in; it thrives in woodlands and sandy loam soils, as well as drought-stricken land. They bloom from September to November and then bear edible fruit between January and March. Giraffes, warthogs, elephants, kudus, and waterbucks all enjoy the leaves and fruit of the tree. The tall marula tree bears up to 500 kilograms of fruit annually. Unlike other traditional trees, the marula fruits fall off while they are still hard and green. Then, they take about five days to ripen. When the trees start bearing fruit, farmers keep animals away by building barriers of thorny branches around it. And now we get to the juicy part. 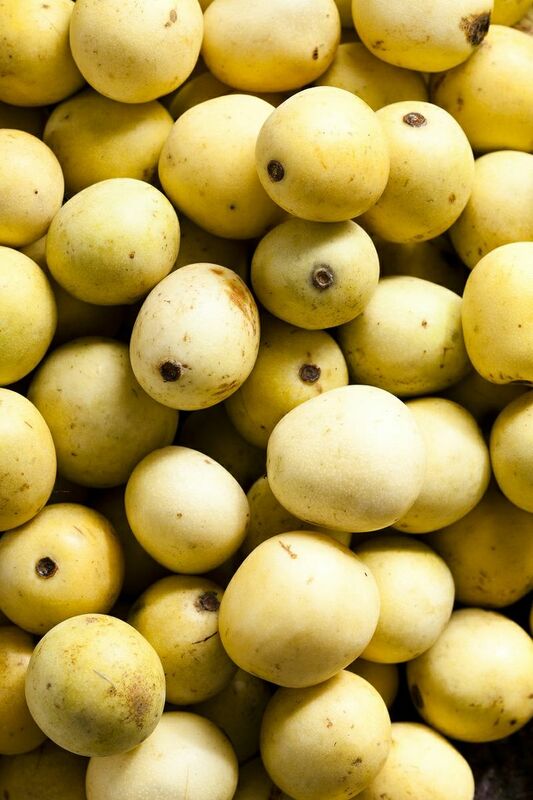 The marula fruit is the size of a small plum and very aromatic. It is very high in Vitamin C and it can be eaten raw. However, people also cook it to make juices, jams, jellies, and alcoholic beverages (more about this in the Marula Beverages section below). When it is fully ripen, the marula fruit is somewhat bitter, but also with a pleasant sweet-and-sour taste. Marula juice trumps orange juice as it contains four times more Vitamin C.
The large nut stone in the middle of the fruit brings its own nutritious benefits. It contains a soft nut kernel with very high nutritious levels. Some eat them fresh, others roast them; either way, they are rich in antioxidants. Marula nuts are approximately 25 percent protein, and they also feature various amounts of phosphorus, calcium, magnesium, and potassium. Dry marula nuts remain fresh for months without spoiling, which makes them ideal as emergency food or dietary supplements during winter. If you thought the value of the marula tree lies only with the fruit and the nut, you’re wrong. Marula oil, which is found in a high percentage in the nuts, has many applications. The product also treats wounds, burns and acts as an anti-aging extract for the skin. Remember when we said that not one part of the marula tree is discarded? Marula wood is hard enough for villagers to use it for making mortars and pestles, as well as drums, bowls, stools, and beehives. On the other hand, the tree’s bark is believed to have medicinal properties. Indigenous communities use it to treat rheumatism, dysentery, diarrhea, insect bites, and many more. Many Africans also recommend marula root tonics for their anti-malarial properties. One of the most appreciated byproduct of the marula fruit is the marula beer. There are many local brews; in southeastern Zimbabwe, for example, the drink is known as “mukundi.” In Swaziland, the popular marula drink causes big sales drop for beer when the marula tree bears fruit. The Namibian government has even issued an official marula wine season to celebrate the potent marula fruit. However, marula is most famous in South Africa, where the exotic Amarula Cream liqueur is commercially produced. The beverage tastes and looks similar to an Irish cream. In the African culture, people offer marula nuts as a sign of friendship, while the large marula tree is often the center of the village and the gathering place for rituals. The tree is highly appreciated for its shade and beauty, while also providing valuable food supplies. Marula trees are not just highly productive; they also indirectly support many agricultural activities, such as beekeeping. The marula flowers are very rich in nectar, which makes for a delicious, light-colored honey. At the same time, locals often use the marula leaves for livestock fodder. Even though it currently grows in the wild, we can learn to eventually grow the marula crop more widely. South Africa processes roughly 500 tons of marula fruit for juice every year, as well as 2,000 tons for Amarula Cream liqeuor. Given the high saturation of fatty acids in marula oil, locals also commercially produce it as a specialty salad oil. Moreover, the cosmetic industry also uses the oil for its anti-aging and non-drying properties. In poor rural communities across Africa, people see the marula tree as an income opportunity. In countries such as Botswana, Namibia, Zimbabwe, and South Africa, villagers often collect the marula fruit and then sell it to processing facilities. Promoting this tree could support sustainable development throughout the continent. The marula tree has the potential to ease the strain of poverty, help regenerate deforested environments, and provide food security for human and animal populations. Fun fact: Marula trees are dioecious, a term used for plants that have a specific gender. This fact contributed to the conviction among the Venda people that marula bark infusions can determine the gender of an unborn child.